As a child, Ricardo García would play a game with his mother whenever the two went on road trips: his mother would give him the distance they were travelling and the speed she was driving and he would calculate how long it would take them to reach their destination. Now a senior at Felícitas and Gonzalo Méndez High School, García recalled the game that sparked his interest in math Friday as he took the microphone at a press conference in his school. He said that having a strong parental influence gave him the foundation to work hard academically. Just last month –he added– he learned he would be going off to Columbia University in the fall. 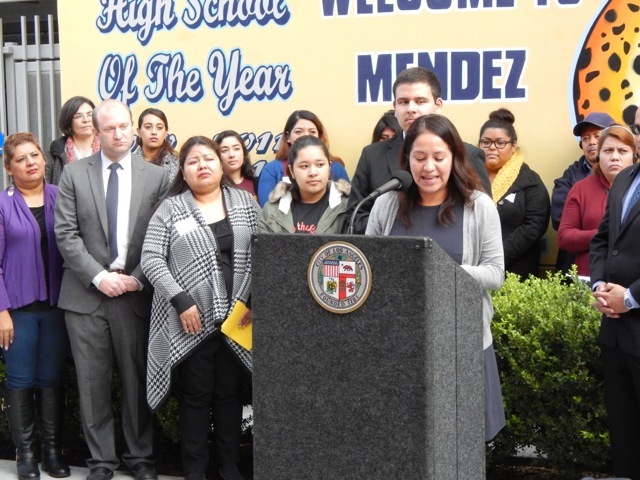 “My success as a student at Mendez was achieved through a collaboration of my effort, support systems at Méndez, and my mother’s unconditional care,” said García. 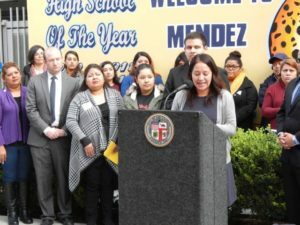 One of those support systems was the Promesa Boyle Heights initiative, a collaborative of some 20 organizations and schools that have helped boost the graduation rate at Méndez and other neighborhood schools. 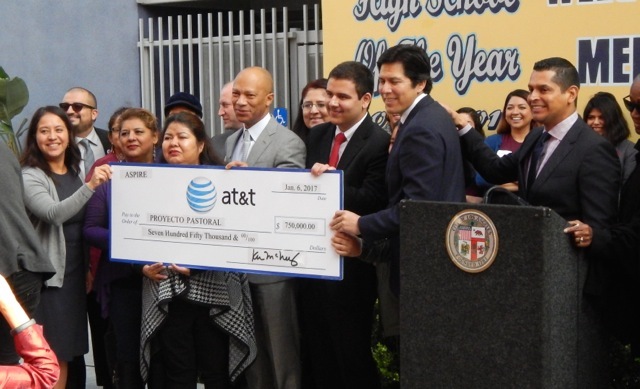 At Friday’s press conference, Promesa Boyle Heights announced it was chosen to receive a $750,000 grant from AT&T through Aspire, the communication giant’s philanthropic arm. This is the third time that Promesa Boyle Heights has won Aspire’s Connect to Success competition for grant money, and this year’s is the largest amount it has ever received. “I’m hoping that it makes a difference – that kids understand that there are, not only organizations, but people out there cheering for them,” said AT&T California President, Ken McNeely. 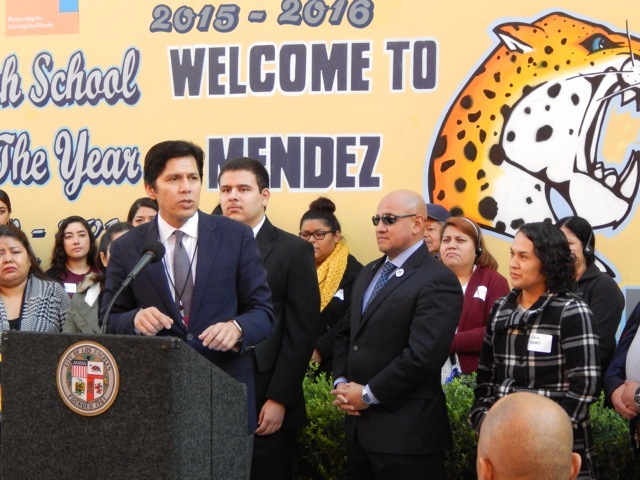 Since Promesa Boyle Heights began in 2011, graduation rates at Méndez have risen from 34 percent to 96 percent for the Class of 2016. 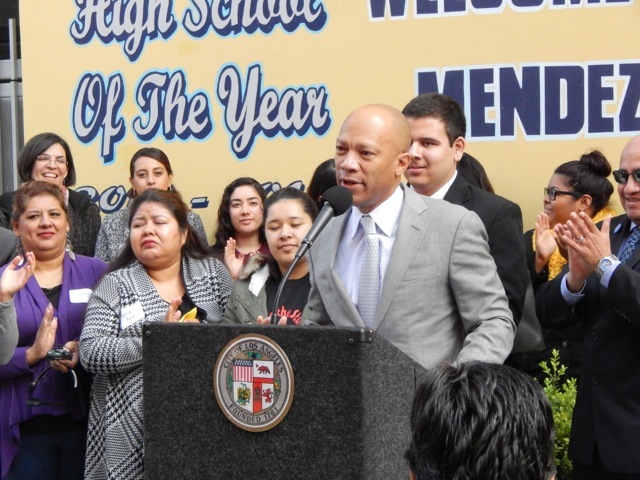 Last year the initiative expanded to Roosevelt High School and to Hollenbeck Middle School. 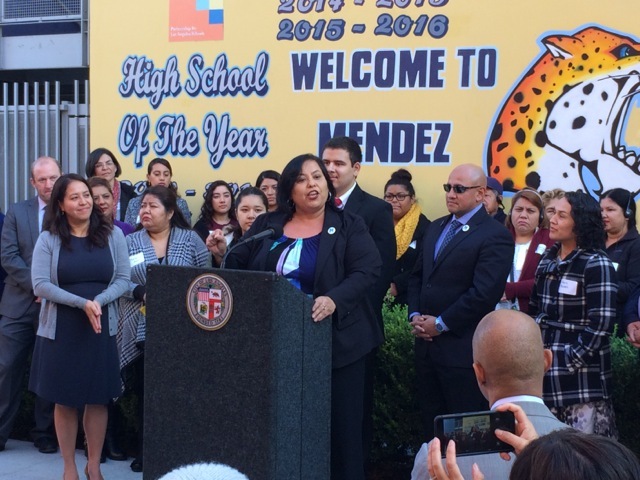 But Promesa Boyle Heights director Deycy Hernández said the new grant would go a long way in helping the collaborative achieve new goals. “The problems change. They’re not the static problems that we see in the community,” said Hernández, who explained that some students may be experiencing mental health issues or dealing with the issues of a changing community due to gentrification. “We are a resilient and committed community, but we cannot do this alone,” said Sánchez. She went on to thank the parents and students who have worked hard to improve the educational climate in the community. “This is a passionate place because you have passionate parents,” agreed McNeely. One of those parents is María Ruiz, who has one son studying at UC Riverside and another in his senior year at Roosevelt High School. “We work with board members and speak to them about our problems. We’re making changes here,” said Ruiz, who said to be proud of her sons’ academic achievement. 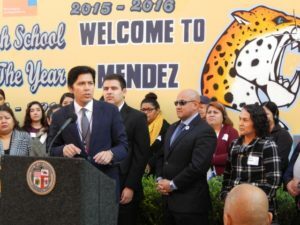 Several elected officials attended the press conference, including California Senate President pro Tempore, Kevin de León, who pledged his continuing support of all students in California despite the national political climate that exists today. “One national election will not change the value of who we are as a people and as a state,” said de León. 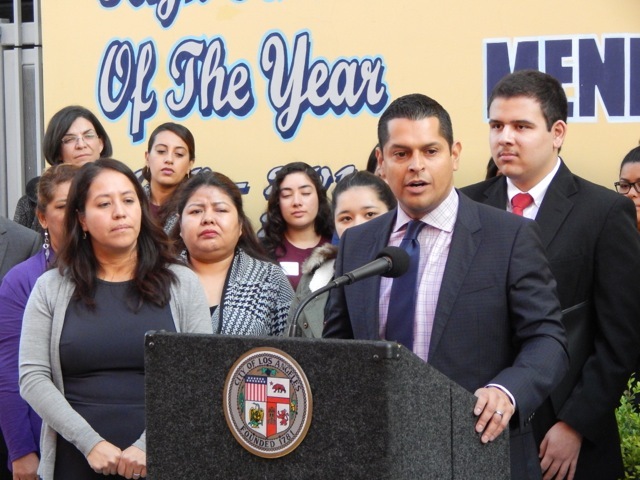 “This community has had a transformative several years, and we want to continue improving it,” said Assembly member Miguel Santiago, who credited Promesa Boyle Heights and the people of Boyle Heights for helping students deal with a changing community. “At the end of the day, it’s all about improving people’s quality of life,” added Santiago. stressed the importance of having good schools, good jobs and having great partners. 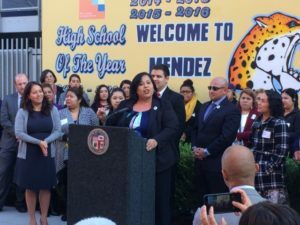 “Today we’re celebrating a community that loves and works every day to make sure that every child knows there is a place for them, they are valued, they are loved and there are great expectations,” said García. Gus Ugalde is a print journalist and Boyle Heights native. 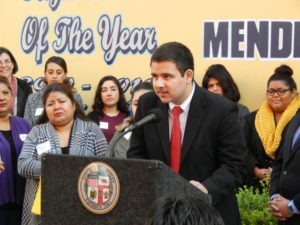 He is a graduate of both Salesian High School and East Los Angeles College. With writing as his passion, he has had over 500 stories published at several publications throughout Southern California.